This prop Smith and Wesson Model 66 revolver was used by the characters “Capt. Riley Hale” (Christian Slater) and Park Ranger “Terry Carmichael” (Samantha Mathis) in John Woo’s 1996 action motion picture “Broken Arrow” starring John Travolta. 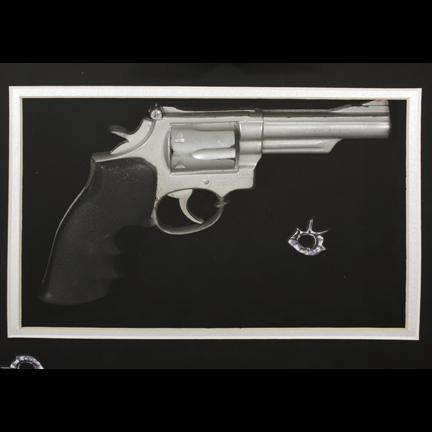 The non-firing prop revolver is constructed of dense rubber with hand painted metallic details and black grip. The gun is seen prominently in multiple scenes near the beginning of the film after Capt. Hale discovers his fellow Air Force pilot “Major Vic Deakins” (played by Travolta) plans to hijack the B-3 they’re flying in order to steal the two nuclear warheads onboard. 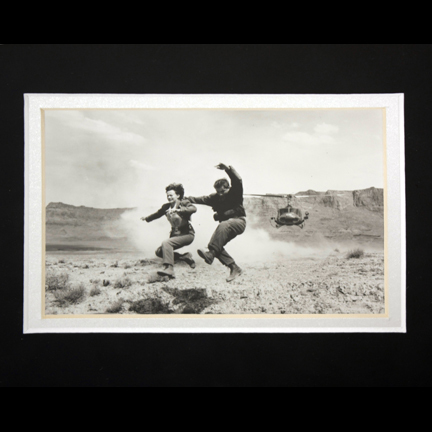 After a struggle in the cockpit, Hale ejects and lands in the middle of the Utah desert where he first encounters Ranger Carmichael. 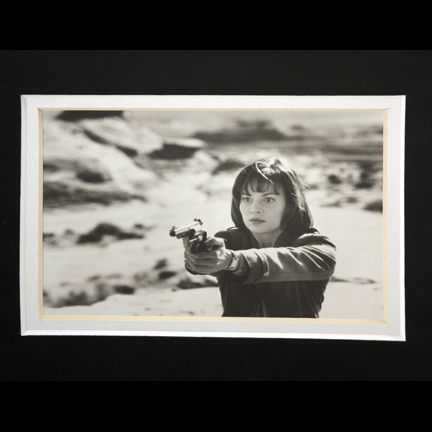 At this point Carmichael draws her Smith and Wesson and this prop weapon was used during the extensive fight sequence that ends with the two in a classic John Woo standoff, with Hale holding this gun to her head while she holds a knife to his throat. Both characters utilized the prop gun at different points during the struggle before they lose the gun off the side of a cliff. The characters then decide to team up and stop Deakins’ evil plot together. 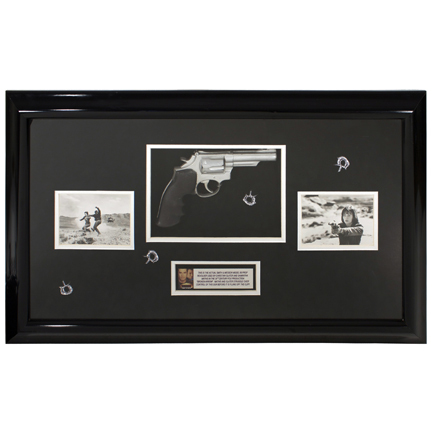 The prop weapon has been professionally mounted in a black shadowbox display measuring approximately 19" high by 32" wide and 2 3/4" deep. The exterior of the glass frame is decorated with faux bullet hole decals, and the interior contains two images of the actors as seen during that section of the film. 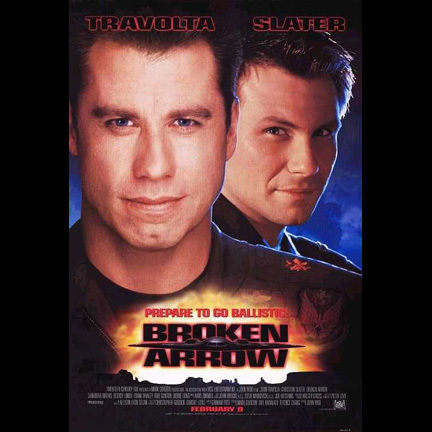 In addition, there is a small plaque with the Broken Arrow logo featuring Travolta and Slater with description reading “This is the actual Smith & Wesson Model 66 prop revolver used by Christian Slater and Samantha Mathis in the 20th Century Fox production “Broken Arrow”. Mathis and Slater struggle over control of this gun before it is flung off the cliff”. 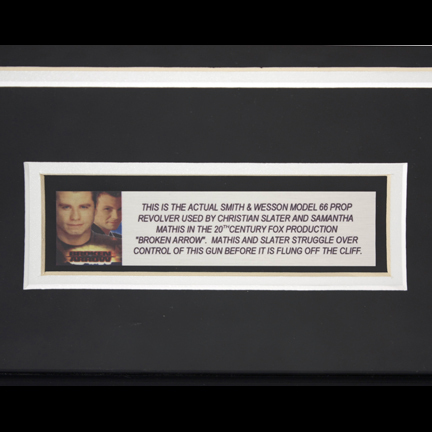 The prop weapon is in good condition with minor evidence of wear from its use in the action sequence and is accompanied by a letter of authenticity. PLEASE NOTE: Due to the unique packing and shipping requirements for this item, additional shipping costs will be invoiced to buyer via PayPal after purchase in order to ship, or please EMAIL US with your name and address for total including competitive shipping rates prior to purchase.